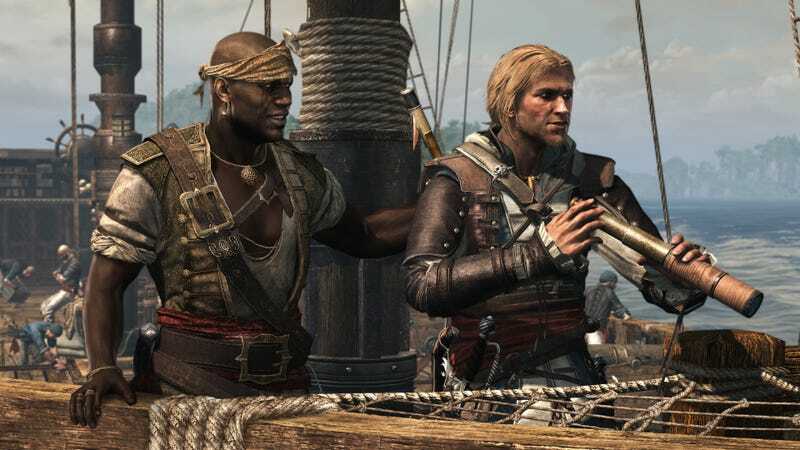 We already know that Ubisoft would like to know if fans want to play an assassin's free pirate-only sequel to Assassin's Creed IV: Black Flag. They also want to know if we'd like co-op, if we want horses back, if we want to play through different time periods in the same city, and.... hey, want to play as a Templar? They want to know tons more. They're asking these things in a survey that I spent 40 minutes of my Saturday afternoon filling out. It wasn't sent to me because I run Kotaku. It was sent to me because I played Assassin's Creed IV and registered for Uplay or something. I don't know. It was in my inbox. I filled it out—not for Ubisoft, but for you. The survey is full of interesting questions that show that Ubisoft knows where some of the franchise's weak points are. It's also clear that they are trying hard to figure out how multiplayer should factor into the franchise and it seems like they're fishing for ideas about who should star in future pirate games. The orange boxes in most of these represent my selections. Note: If you want to skip to the juiciest stuff, scroll down or simply search for the phrase "good stuff" and read from there. Did I like this game? Some absurdly specific questions about guns and swords and the mortar, of all things! Yes, the game was a bit easy. I think they know that. Note this next one, because you'll spot a theme. They're testing to see how much we care that these games are open-world and later ask about my interest in a certain other open-world game and a certain other linear action game. For the first time (but not the last), they test interest in a non-assassin pirate game. And here's that thing about open-world again. What's the deal with that? Ah, yes. Time to tell them that enough is enough with all of the tailing missions. Here goes! On to multiplayer, which, as with the game, I'm mostly going to skip. And now... the good stuff about the future of Assassin's Creed. Prepare to raise your eyebrows a few times! Let's wind this down with some of the final odds and ends that include a few more hints about the possible future of the franchise. Plus: more obsession with open-world games! And maybe some concern that we might be interested in buying a new Red Dead? Hmmm. Hmmmmmmmmmmmmmmm. That's it. So much to chew on. Chew away, everyone! And for pete's sake, Ubisoft, please keep AC games open-world. And do that multiple-eras-in-one-city-thing.